M.Sc. in Applied Chemistry is a 2-year postgraduate course program in Applied Chemistry. Eligibility for this is a Bachelor’s degree in science subjects like physics, chemistry or biology and has secured an aggregate of 55% or equivalent CGPA. The fee for the course varies between INR 10,000 and 2.3 Lacs in India. The course is an application of study of chemical elements to the industry and the arts. It helps students to demonstrate their ability as personal researchers and problem – solvers. The course structure is reflective of the same with theory and practical courses in every semester and also a dissertation at the end of the course. Graduates of M.Sc. in Applied Chemistry have a wide range of job opportunities like Government agencies, supply, and distribution of medicine, Defense services, Research colleges / Universities, Hospitals, Private clinics etc. Opportunities are not limited to the said fields. Once completed, the graduate may pursue further studies and may complete their Ph.D. or may take up said job opportunities associated. 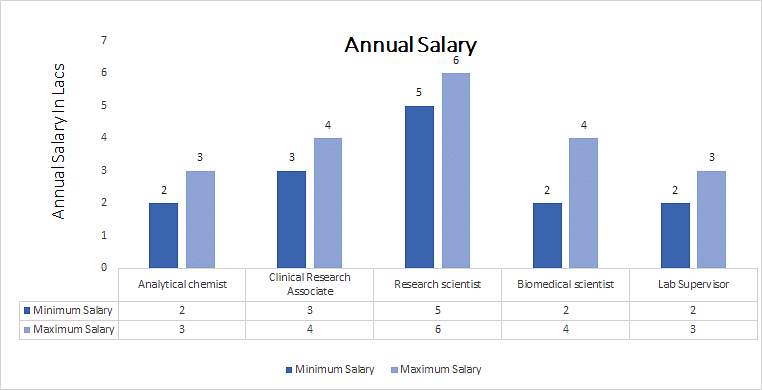 The average salary for a Master’s of science in pharmacology is between INR 3 and 4 LPA starting. Average Salary INR 3 and 4 LPA starting. Top Recruiting Companies Government agencies, supply, and distribution of medicine, Defense services, Research colleges / Universities, Hospitals, Private clinics etc. Job Positions Lab supervisor, researcher, technician, scientist, professor, analytical chemist, lab chemist, production chemist, chemical engineering associate, biomedical chemist etc. M.Sc. in Applied Chemistry: What is it about? An applied chemistry degree program focuses on combining chemistry and engineering. Scholars in a program may learn about various aspects of chemistry, such as nanomaterials, corrosion science, analytical chemistry, liquid chromatography, and spectrometry. Students may also study natural resources, environmental contamination, occupational health and safety, risk management and environmental toxicology. Courses may also cover physical and materials chemistry, such as colloidal chemistry, nanobiotechnology, and photocatalysis. Programs may include a research project that lets participants put their studies to practical use. Completing the program can enable an individual to develop advanced research skills that can then be applied to a future career. In addition, students may learn skills that enable them to make new discoveries in the field of applied chemistry. The course is a basis for the deeper understanding of chemical elements for any kind of research and is also very beneficial for people looking to teach in the field. It is a mandate to pursue Ph.D. in the field of chemistry. Aspirants should hold a Bachelor of Science degree in Applied Chemistry or it's allied field to choose Master of Science in Applied Chemistry as a higher study option. At least 60% aggregate marks are needed at this level to apply for this course in top institutes. Minimum marks in the entrance tests are also needed for applying for this course in certain institutions. Admission is based on the score in one of the entrance exams. The merit list may also be considered based on merit percentage. Career Prospects for M.Sc. in Applied Chemistry are many depending on the level of expertise and experience in the industry. They are hired for profiles from lab supervisor to Research assistant. The average salary is between INR 3 and 4 LPA. The employment areas are among government agencies, biotechnology units, chemical agencies, labs, chemical manufacturing units, oil industry, petroleum sector, pharmaceutical sector, heavy chemical firms etc. The job profiles for these positions range as a Lab supervisor, researcher, technician, scientist, professor, analytical chemist, lab chemist, production chemist, chemical engineering associate, biomedical chemist etc. The compensation and salaries for these individual jobs are specific and depend largely on the skill-set they have built and the experience in the industry.